Notes: Brunnenburg (Italian: Castel Fontana) is a 13th-century castle in the province of South Tyrol, in northern Italy.Schloss Brunnenburg is situated above the city of Merano, on the outskirts of the municipality of Tirol. Originally built circa 1250, the castle was completely restored and updated in the mid-20th century by Boris and Mary de Rachewiltz, who have made it their home. Boris de Rachewiltz is an Egyptologist. 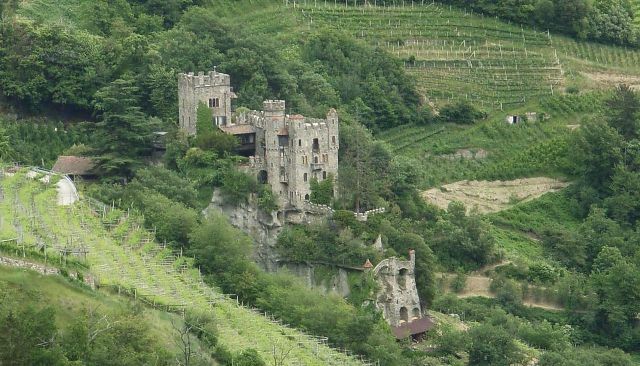 Surrounding the castle is the family's vineyard. Mary de Rachewiltz is the daughter of the poet Ezra Pound and the violinist Olga Rudge. Pound stayed with her and her family at the castle in 1958 after he returned from the United States. He wrote the last 6 of his 116 "Cantos" of The Cantos. Mary de Rachewiltz has also established "The Ezra Pound Centre for Literature" at the castle, where students come from all over the world to study her father's works. One of the outbuildings at the castle is a large guesthouse, used as temporary housing by the students who come to study, usually for a semester at a time.